Can Lee’s Young Shoulders Cope with the Weight of Expectation? 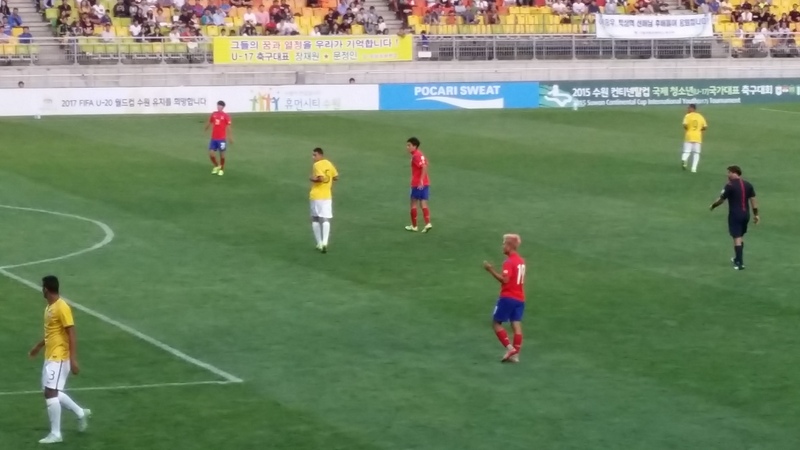 Barcelona youth prospect Lee Seung-Woo attracting attention back in Korea. Over the last week, large crowds of fans visited Suwon World Cup Stadium, the self-appointed ‘home of Korean football’ to watch the Korean Under-17’s in action against Brazil, Croatia, and Nigeria. The majority of the fans present were there to see one player, and one player only, the pink haired Barcelona youth star Lee Seung-Woo. Lee’s goal-scoring antics for the Barcelona youth team have not only caught the attention of La Masia’s coaches, but have been making headlines on the other side of the world too. Koreans, hoping that Lee Seung-Woo can be the next superstar of the Korean national team are watching his every move with anticipation. Comparisons to Barcelona’s star player, Lionel Messi, have been made, partly due to his position on the pitch and his relatively short stature, but also due to him beating Messi’s scoring record at the same age for Barca’s youth team. That Lee has been so impressive in his current age-group has created an expectation that he will end up being as good as Messi is once he reaches maturity, but such expectations fail to take into account the different ways that footballers develop. Arsene Wenger claims that from sixteen to eighteen, it is possible to see whether a talented individual can play as part of a team, and it isn’t until a player is in his early twenties that you can tell whether a player has what it takes mentally to be a top player. Indeed, Lee was a footballing prodigy at the age of twelve, and absolutely owned the AFC Under-16 tournament that he played in, but he has made far less of an impact at Under-17 and Under-18 level. There have been countless other individuals who were world-beaters in their early-teens but who never quite made it professionally, so it is unfair on Lee Seung-Woo that people have such high expectations for him. In 2007, Bojan Krkic made his Barcelona debut, and at the time was hailed as the ‘new Messi’. In that season, he actually scored as many league goals as Messi for Barcelona’s first team, but in the end he didn’t reach Messi’s heights and still only has one international cap to his name. He is currently rebuilding his career with some impressive performances for Stoke City, a come-down from the heights of Barcelona and Roma, but still a relatively strong team in one of the world’s strongest leagues. If Lee Seung-Woo reaches Krcic’s level, Koreans should be pleased that he has still made it as a Premier League standard player, rather than feel disappointed that he hasn’t won a Ballon D’or. That is not to say that he won’t necessarily make it as a top player, and indeed most of the sounds coming out of Barcelona suggest that they think he can play at the highest level themselves. The real test for Lee will come next year when he becomes eligible for competitive matches with Barcelona-B. Playing against fully grown opponents will help develop Lee’s game, he struggled against Nigeria’s larger defenders last week, and a year up against this sort of opposition will be a real test of him mentally and physically. If he can survive that test and make an impression on the Barcelona-B side then a first team debut might not be too far off.